This is a cautionary tale about ergot. 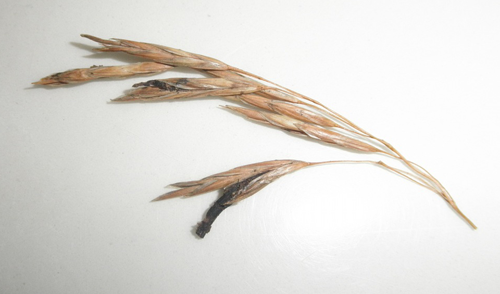 Ergot is a fungi of the genus Claviceps that is a parasite of grains — primarily rye, but also triticale, wheat, barley, sorghum, pearl millet and rarely, oats. It has two major effects: (1) hallucinations, often with convulsions or epileptic symptoms, and (2) constriction of the blood vessels in the extremities that lead to gangrene and/or death. Generally, it is one or the other, which predominates likely depends on ergot genetics and the alkalinity of soil in which it grows. Other symptoms include strong uterine contractions (making it an effective abortifacient), nausea, seizures, high fever, vomiting, loss of muscle strength and unconsciousness. Its active ingredient is lysergic acid, a precursor to lysergic acid diethylamide or LSD. Historically, tens of thousands of people have died, been disfigured, or gone mad from ergot poisoning. Today, it is controlled and very rarely effects anyone. Historians have speculated that lysergic acid in ergot may have been converted into ergine by boiling ergot-infected rye for an extended period of time. This process matches historical recipes for kykeon, which was the drink culminating a religious fast in the Eleusinian Mystery cults and perhaps used in other mystery cults as well. While there is some archeological evidence for the existence of rye after the Bronze Age, it did not become a widespread food staple until the Middle Ages. Except for the apocryphal year punishment, these outbreaks of dancing mania closely match the descriptions of the Eleusinian Mystery rites after consumption of kykeon, which suggests a reaction to a hallucinogenic variety or ergot. Perhaps, the psychological effects lasted for a year because that’s how long it took the population to eat through their store of rye grain for that year? Whether this story is an accurate depiction of events or has apocryphal elements, it is clear that a widespread mania is preferable to gangrenous ergotism. The first major documented case of gangrenous ergotism happened in the Rhine Valley, in 857 A.D., but it recieved it’s common name of “St. Anthony’s Fire” during the 1039 C.E. outbreak in Dauphiné, France. The cause of ergotism, at that time, was unknown. It’s not hard to imagine that those inflected with madness from ergot would be seen as being possessed by the Devil and the gangrenous form as punishment for sin. To speculate, perhaps ergot had a role to play in religious purity movements such as the strict vegetarian Carthars and the subsequent Catholic crusades and inquisitions that were in response to it. Millers understood the difference in the flours and why some rye was ‘spurred’ long before Denis Dodart. People also understood the connection, because the ‘spurred rye’ was eaten last, when all the other stores of food were gone and the spring crops had not reached the point of harvest, a period once referred to as “the starving time”. It wasn’t until the famine in continential Europe in the 1770s that an alternative food source, i.e., the potato, was adopted that food security became important to nations and famine in Europe was brought under control. With an alternative, there was less need for the poor population to eat ‘spurred rye’. Even then, as late as the 1800s, there were some documented epidemics where up to 40% of a population dependent on ergot contaminated rye for food would die from the disease, which were presumably better odds than surviving a famine without eating it. Knowing the context beyond “somehow became poisoned” changes the way we understand the king’s situation. On one level, it’s a cautionary tale on ignorance. Ergot is a completely preventable disease. Before milling, the rye grain needs to be soaked in a saline solution which seperates the ergot from the grain. Ergot spores live in the first inch of soil and only live for a year, which means that deep tilling and crop rotation can be effective in eliminating it. But, you cannot address a problem, if you don’t understand it. It is why that there were waves of ergot poisioning decimating urban populations every few years for centuries. This cautionary tale was a fact of life for community leaders in a previous time. On another level, it invites us to revisit our notions of madness and the role of hallucinogenics in society and for individuals. If it is true that in a time when everyone is mad from ergot that it is important that a king “keep a few people apart and feed them an unpoisoned diet of the grain from previous years”, perhaps it is equally as important to keep a few mad people that will remember what it’s like to not be strapped to the yoke of sanity. Our literature is filled with stories of shamen, oracles and seers that can see beyond the social framework of the sane. There are spiritual traditions — mostly among aboriginal communities but also within civilized society, such as the Eleusinian Mystery cults — where a ritualized experience of madness is a valuable vehicle for personal and social transformation and bonding. Perhaps in a world where ergot poisioning has been eradicated, some hallucinogenic ergot should be kept aside for those that would choose it. Why would anyone choose it? —Scott Alexander, WHY WERE EARLY PSYCHEDELICISTS SO WEIRD? The current trends of LSD microdosing suggest that trying to be a little more interesting might pay real dividends in our society. One is left to imagine the power of a communal approach to expanding openness, such as in a context like O Centro Espirita Beneficente Uniao do Vegetal, where hallucinogenics are taken as part of a religious experience.